The Vizzion production version will retain the concept's fastback styling familiar from grand tourers. GENEVA -- Volkswagen will launch a full-electric midsize sedan by 2022 based on the design of the I.D. Vizzion concept unveiled by the brand at the auto show here on Tuesday. The sedan will be an indirect replacement for VW's Phaeton flagship sedan. It will be smaller than the Phaeton but will be as spacious inside because a battery pack replaces the bulky combustion engine, VW brand CEO Herbert Diess said. Diess said VW brand will introduce a production version no later than 2022 as the top of the range sedan for the I.D. family of full-electric cars. The Vizzion production version will retain the concept's fastback styling familiar from grand tourers, but elements such as the distinctive suicide doors will not be adopted to save costs, VW brand development chief Frank Welsch said. The Vizzion concept can drive autonomously and has no steering wheel. VW said the initial production version will have conventional controls. It should cost roughly the same as a diesel midsize sedan. A comparable four-wheel-drive version with a 2.0-liter diesel engine and 187 hp starts at a little more than 41,000 euros in Germany. The Vizzion has a 225-kilowatt output, equivalent to 300 hp, and can travel up to 665 km (413 miles) on a single charge. Its two electric motors will be placed on each axle, automatically giving it all-wheel drive. VW said it will launch sales of the first I.D. models, the I.D. compact hatchback and the I.D. Crozz, next year. 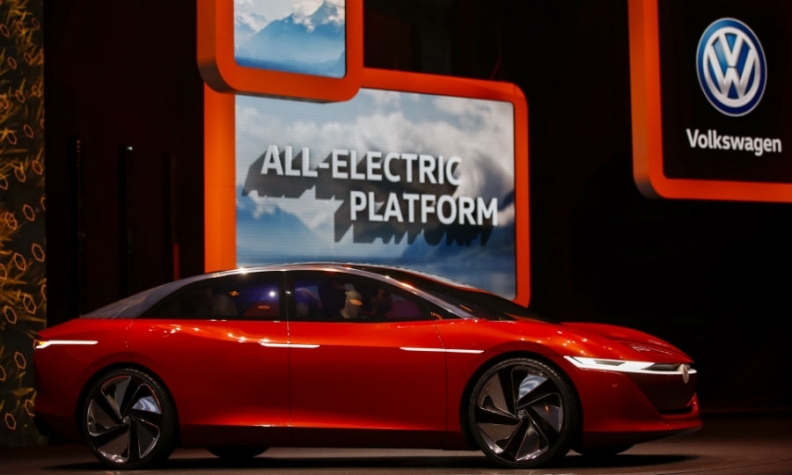 The two cars will be the brand's "Golf and Tiguan" of the electric era, Diess said. He said VW brand plans to build about 1 million full-electric vehicles a year by 2025. Another I.D. family member, the Microbus-styled I.D. Buzz, will launch in 2022, VW said.